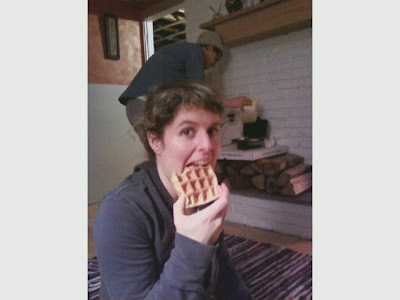 Sorry I am posting this picture of you eating a waffle. Please don’t be mad at me. Last night I went to Lea and Chives’ house, mainly for a pottery night. I succeeded in throwing my first pot (a shallow, clunky bowl really), which was fun albeit pretty difficult. Luckily, Chives is a patient and skillful teacher and while there are no photos of last night’s pottery session, you can expect some soon. Maybe it was because it was around dinner time, or perhaps it was being in a studio surrounded by Chives’s and Lea’s beautiful handmade bowls, mugs, and plates, but we all got hungry. Chives wanted pancakes, but with a torn out kitchen due to their current remodeling projects, pancakes seemed unlikey. “We could go back to my house,” I suggested. I have to admit I was skeptical about this idea. Waffles? No kitchen? Really? What a fool I can be! Lea ran to the grocery store, we went into the living room, cleared off the coffee table, Chives set up the waffle iron on top of an old pizza box which was put on top of some logs, and we mixed up the batter. Lea also pulled out a pomegranate, a container of Greek yogurt, and a jar of honey. “I thought we could have waffles with Greek yogurt and honey,” she said, hereby adding one more reason to the already 1,256 reasons why we are friends and I love her. I never would have thought of putting these things together on top of a waffle, and the combination was one of the best things I have had in ages. 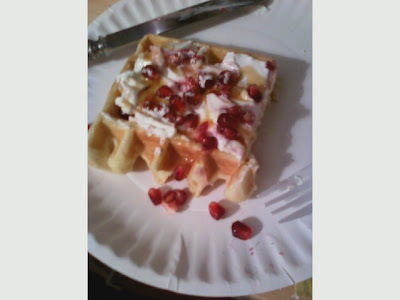 I admit I strayed at one point and topped my second waffle with maple syrup and butter, but quickly went back to smearing it with yogurt and honey before decorating it with the tart, juicy, pomegranate seeds. 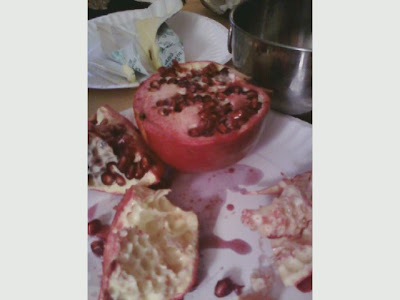 Lea said at one point she liked pomegranates because there is something so historic about them, and I agree. It is one of the most ancient fruits- and while I suppose it was the apple that Eve bit, the pomegranate seems so much more forbidden. So putting this on top of a waffle? With one forkful windmills collided with ancient pillars, Ode on a Grecian Urn traded lines with Hans Brinker or His Silver Skates, yellow tulips bloomed under towering Cyprus trees. And this was all happening in my mouth, while I chewed. Lea didn’t have vegetable oil so we used olive oil instead, but this just added another subtle dimension to the already wonderfully unexpected amalgamation. All this with only a waffle iron plugged into an electrical outlet in the living room. Sounds good. I'm sure the waffles were tasty. The best food is often the spir of the moment ideas.